Salgado polled 8,431 votes to Samarawickrema's 7,863. While Wanigaratne also from Thurstan College who was placed third last week, was placed second with 8,023 votes. 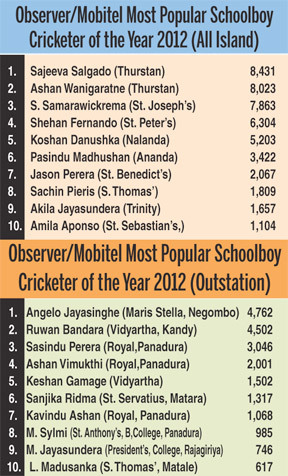 In the Outstation category, Maris Stella's Angelo Jayasinghe who was second last week, was placed first with 4,762 votes pushing last week's winner Ruwan Bandara of Vidyartha College, Kandy to second position with 4,502 votes.